Coppell senior Jeremy Basso competes in the triple jump during the Class 6-6A District Track and Field meet, which started Thursday and concluded yesterday. The Cowboys won the meet, while the Cowgirls placed second. Air slapping his face and lungs burning, Coppell junior Jackson Walker uses every ounce of his energy in the last stretch of the 800-meter race, finishing first and breaking his own school record with a 1:52.13. 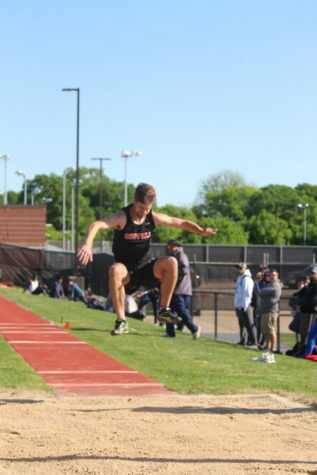 That win, along with the dozens of other Coppell athletes’ top finishes, helped the boys varsity track team seize first place in the Class 6-6A District meet last night at Buddy Echols Field, marking its fourth consecutive district title. The girls varsity team earned second overall. Coppell’s breadth of talent was its biggest strength, according to coach Karl Pointer. Each event’s top four advances to the Area meet on Thursday at Keller High School. Coppell sophomore Morgan Colon and senior Rowan Hassman qualified in the 800-meter run, placing second with a 2:18.41 and third with a 2:19.02 respectively. On the field, Coppell senior Corbin Hicks won both shot put and discus, scoring numerous points for the Cowboys. 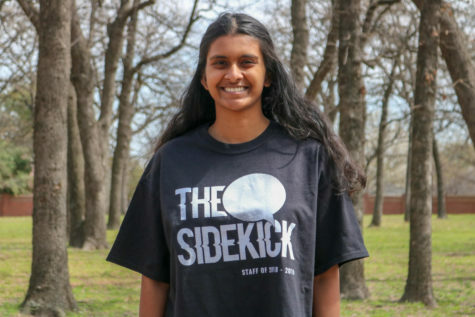 Because it has faced many of their district opponents throughout the season, Coppell had an idea of what to expect at yesterday’s meet. Pointer saw Hebron as the Cowboys’ biggest competitor and Marcus as the Cowgirls’ toughest foe. After a bad handoff in the varsity boys 4×100 relay – yesterday’s earliest running event – Coppell finished sixth while Hebron finished first, making the rest of the meet very tight. But winning the 4×200, along with other wins, helped the Cowboys gain back points.